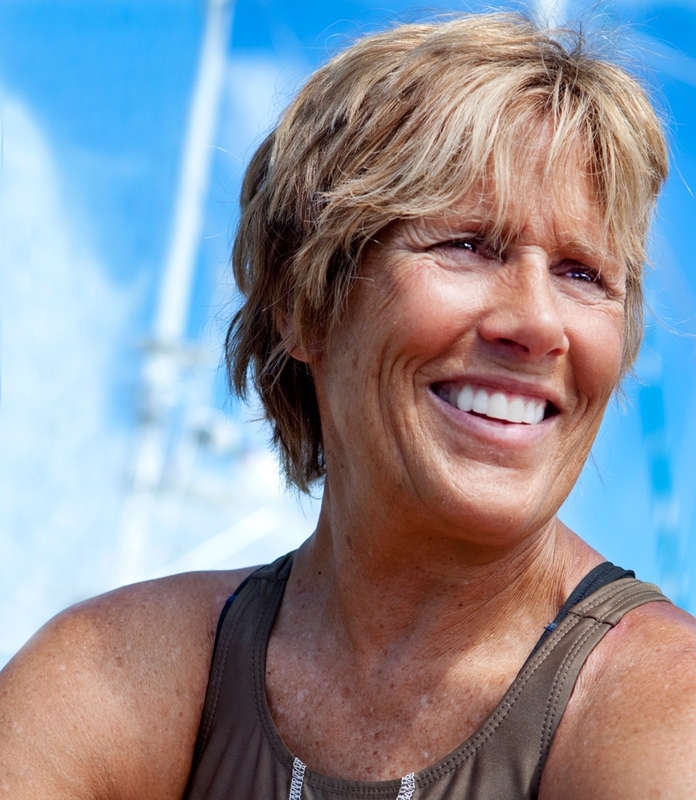 MIDDLEBURY, Vt. - Diana Nyad, who last year defied the odds and dangers to achieve her lifelong goal to become the first person to swim the 110 miles between Cuba and Florida without the aid of a shark cage or fins, will deliver the 2014 Middlebury College commencement address on Sunday, May 25. A remarkable all-around athlete, Nyad set open-water records in the 1970s for speed when she swam around the island of Manhattan in under eight hours and for distance when she swam the 102.5 miles from the Bahamas to Florida. Retiring from competitive swimming at age 30, she focused on writing and broadcasting, becoming the author of three books, and reporting for such media outlets as ABC, CBS, and NPR. Nyad returned to the water at age 60. She made three attempts to swim the full distance from Havana to Key West before completing the epic journey last year at the age of 64. Nyad will receive a Doctor of Humane Letters at the College’s commencement ceremony. Carl Douglas, a 1988 Middlebury College graduate and native of Sweden, is an acclaimed underwater explorer. One of his most notable discoveries was the wreckage of a Swedish spy plane that had been lost over the Baltic in 1952. The find proved the long-held suspicion that the plane had been shot down by a Soviet fighter. Douglas also is the founder of Deep Sea Productions (DSP), a publishing and documentary film company that has chronicled the discovery of more than 100 air- and sea craft, including a 17th-century Swedish warship and a World War I British submarine. Based outside of Stockholm, in Akersbergai, Sweden, DSP made the discoveries working with Sweden’s largest private marine survey company, MMT, where Douglas serves as chairman. He will receive a Doctor of Letters. Angélique Kidjo is a Grammy Award-winning artist and advocate for social justice. Called “Africa’s premier diva” by Time magazine, Kidjo offers a unique musical repertoire that draws on Afropop, Congolese rumba, jazz, rhythm and blues, gospel, and Latin styles. A Grammy winner (Best Contemporary World Music Album) for her 2007 work Djin Djin, she recently released her 12th album and published a memoir titled Spirit Rising. Kidjo, a native of Benin, has worked as a UNICEF Goodwill Ambassador since 2002. She also created Batonga, a foundation that supports the education of young African girls. Last fall at Middlebury College, Kidjo gave an electric performance, an event preceded by a memorable public conversation that served as the 2013–2014 John Hamilton Fulton Lecture in the Liberal Arts. She will receive a Doctor of Arts. William H. Kieffer III, a member of the Middlebury College Class of 1964, was an executive with Boston-based State Street Corporation for 29 years, retiring in 2002. An emeritus trustee of Middlebury since 2008, Kieffer has also worked in numerous volunteer leadership roles for the College during the past 50 years. He has served in such positions as charter member and vice chair of the Board of Trustees and as the only chair of the Board of Governors for the Monterey Institute of International Studies, leading the Institute’s board for nine years. Kieffer is currently a co-chair of the Middlebury Language Schools Centennial Celebration, scheduled for 2015. He will receive a Doctor of Humane Letters. Richard Levin is president emeritus of Yale University, serving from 1993 to 2013 during one of the longest and most distinguished tenures in this position at Yale. Under his direction, Yale became a true international university, launching the Yale Center for the Study of Globalization and, in collaboration with the National University of Singapore (NUS), the first liberal arts college in Asia, known as Yale-NUS. Levin also oversaw a successful $3.9 billion fund-raising campaign; expanded and improved the university’s facilities and infrastructure; and partnered extensively with the City of New Haven on efforts to stimulate the local economy. His career at Yale began when he joined the university’s economics faculty in 1974. In April 2014, Levin became CEO of Coursera, a platform for the provision of free, open, online courses offered by more than 100 universities around the world. He will receive a Doctor of Letters. Reuben Mark, a 1960 graduate of Middlebury College, is the retired chairman and CEO of Colgate-Palmolive, where he worked for more than 45 years. As chief executive for 25 years, he was the longest-serving leader in Colgate’s history as a public company. His focus on company culture and incremental business improvement led to extraordinary growth and global expansion—and a steady transformation of Colgate-Palmolive into one of the world’s leading household consumer products companies. He served as a Middlebury trustee from 1985–1994 and has been a staunch supporter of faculty scholarship, teaching, and development. Mark will receive a Doctor of Laws. The Middlebury College commencement ceremony will be held on the main quadrangle behind Voter Hall on College Street (Route 125) at 10 a.m. on Sunday, May 25. More than 5,000 family and friends are expected to attend. I've heard Diana Nyad speak - she's, funny, strong, generous with an incredible story. Great choice!